Since the very beginning Kohler has strived to create generators that surpass expectations. Each generator they offer certainly exceeds expectations and offers exceptional quality time and time again. Despite being one of the most popular brands available today, all Kohler generators are affordably priced. What can you expect with one of the fine Kohler generators? Heavy duty generators that can tolerate even the most extreme weather conditions including ice, heat, heavy wind and heavy rains. The Kohler power generator design includes Hydraulic Valve Lifters which reduce the new home generator break-in process. Kohler also offers durable engines that provide the power you need to keep the fridge, appliances, and equipment running until power is fully restored. Kohler offers an extensive variety of sizes to accommodate businesses and homes both small and large. The smallest being a 6 kW home generator. The largest Kohler generator offers an impressive 150 kW of power! No home or business is too small or large for Kohler standby power generators. In order to ensure uniform and reliable power, the correct size backup power generator must be considered prior to the installation. While generators can be variable in sizes, the typical residential generator is the size of an AC condenser unit. More importantly, one must consider the kilowatts (KW) capacity for the expected needs. This can be difficult to the average consumer as different models can vary in size from 6 kW to 22kW on the smaller end and 100kW to 150kW. Kohler offers generator transfer automatic switches and manual switches. A Kohler automatic switch generator gives you hands-free switching from outside utility power to generator power, and back to your main utilities once the power is restored. A Kohler manual switch generator offers you more control, but of course you will have to find the generator and the switch during a power outage in order to turn it on. To create the backup system which is optimal for the desired uses, we take into consideration the maximum power needs. This means calculating the specific requirements of your appliances and how much power they will require to boot the whole house. Kohler industrial generators can be much larger for commercial and industrial demands. If the reasons above are not enough to convince you that Kohler generators are among the best on the market, there’s still more! Kohler generators are made to a higher quality and more durable than other brands. Kohler brand generators, while not the cheapest out there, are still affordable. Financing is available for those who qualify, helping you make the purchase even easier. If you want to own the best, it is very well possible, even if you are on a limited budget. The Kohler generators are among the most powerful on the market. It is this factor that has helped the brand build such an immaculate reputation over the years. Kohler generators never fail to meet your expectations. Kohler brings confidence to your life when you need a backup generator that’s not going to disappoint. For peace of mind for many years to come, Kohler is the name to know. Kohler generators for residential use provide you the choice of units from 6 kW to 24kW. 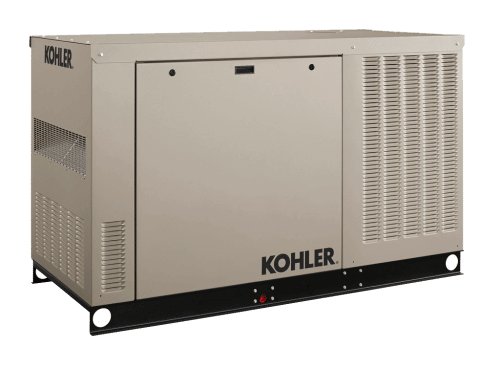 These units are offered in both Kohler liquid propane models and Kohler natural gas generator choices; although it is the larger generators that generally use the liquid propane. Kohler Residential generators are quite, with only 62 dB of noise transmitted during operation. In addition to the Kohler residential generator for your home, ARK Generator Services offers Kohler commercial generator options for businesses, shopping centers, business buildings, nursing homes, medical facilities, multi-building residential sites and more. Kohler diesel commercial generator are available to accommodate businesses of all sizes, with remote monitoring available. Choose from single or three phase units or off-grid use. Each Kohler Commercial generator will have an aluminum, steel, or composite enclosures to protect it from the elements. Why purchase a Kohler Commercial generator for a small business? Kohler generators are there to help prevent loss when electricity goes out. Do not let a power outage devastate your ability to conduct business or incur a loss of refrigerated inventory. A Kohler generator can assure your business is well lit and more secure to vandalism. Just pick up the phone to speak to one of the trained Kohler generators experts at ARK Generator Services without delay! We service the entire Conroe, and Montgomery County area with Kohler generator installation, Kohler generator repair, and Kohler generator sales, including those in Kingwood, New Caney, Humble, Spring, The Woodlands, Montgomery, Magnolia, Huntsville and Trinity. You’ll never be in the dark again.